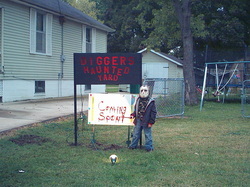 The Diggers Haunted Yard was started in 2007 with a small 8'X8' cemetary!! From November of 2007 till October of 2008 I worked at learning how to build props.By October1,2008 I had built enough props to fill the yard!! I also had made a moving prop by putting a fan head into a skull to make it go back and forth,my first moving prop. Ater the 2008 season I worked on making moving props.At this time,August of 2009 I have made 7 moving props.I have made 2 Peek-A-Boo's,1 kicking leg prop,a witch stirring a cauldron,another cauldron with 2 heads spinning in it,A small skeleton(child size)on a BBQ spit and a lunging vampire prop!! !Hope I have enough electric!! 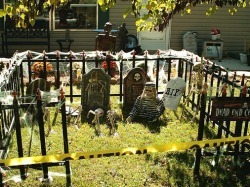 The 2009 haunt was a blast.People were stopping by all month long,day and night looking at the props! !I had 7 moving props in all and the whole yard was full.I had 125 trick or treaters anf many adults came alone to check it out!! More and more people are stopping by each day and traffic goes slown past the haunt.My neighbor Lindsey also has a great yardhaunt too,so people are checking both of them out.I made 2 more moving props,a rocking grandma and grandpa.I was running out of yard space so I made a zombie compound in the fenced backyard,then put up fake barbwire to keep them in!! I ended up having around 140 trick or treaters.My friend Bruce Berghager handed out candy so I got to interact with the crowd. My 2 nephews helped out also!! I noticed people were kind of hanging out too!! 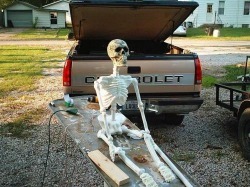 I also scored another real coffin,a Batesville!! 2011 turned out to be a challenging year.I had built 2 buildings to be added to the haunt..1-5'X10' and a 4'X4'.These were the new homes for my animated Jason,Freddy and Pinhead.The buildings were built,then I made all the backgrounds,special effects and lighting.Then they were taken apart.I took off sept.28,29,30 from work to start setting up.I reassembled the buildings and it was on,a race against time,I wanted to be done by the 1st of october.I had some help from my friend Bruce Berghager,but tried to do most of it myself.By saturday,oct 1st at 6:00pm I had almost all the electric cords and timers hooked up.I lit it up but had to finish the rest sunday the 2nd!!! People poured in all month long, everynight to see my display.Halloween night was a blowout.I had Bruce and Roger Berghager handing out candy and my nephews Hunter and Fischer Grupe scaring people.We all had a great time.Halloween was over at 8:00 pm by city law,but people kept showing up till about 9:00 pm.By 5:30 Nov 6th everything was down and put away except a pile of guts still laying in the zombies sandbox.See ya in 2012!!!!!!!! !